Oops - we don't appear to have a video for the DR-C125W. Wi-Fi communication has become popular, now built-in to PCs by default, Wi-Fi routers becoming cheaper to attract end users and many PC peripheral devices now available. In order to satisfy this demand in the market, Canon is pleased to launch a new model of the DR-C125 with Wi-Fi capability added. 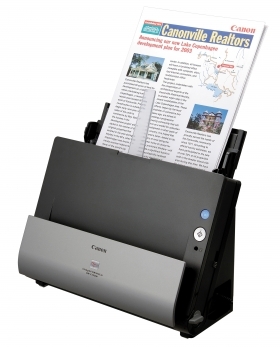 This new product means users can scan straight to a tablet device/wireless enabled PC, making scanning even more convenient and quick. Where LAN is not available, set Access Point mode. The DR-C125W/WU-10 itself becomes the access point and establishes direct communication with devices such as an iPhone. With this mode, the DR-C125W/WU-10 communicates with the PC, iOS or Android device via access point in a network environment. The scanner can be shared with multiple computers on the same network via the access point, although only one can connect to the scanner at a time. In order to build a connection in Station mode without WPS, you need to connect using AP mode first, then switch to Station mode after you have changed the Wi-Fi setting. Up to 5 access points can be registered on the DR-C125W/WU-10. The DRC125W/ WU-10 searches active access points in numerical order to build a connection when turned on. Once you establish a Wi-Fi connection with the ScannerWireless Connection Utility, ISIS/TWAIN applications, which are used with USB connection, work in a wireless network as well without any changes in operation. Only one PC/Tablet device can build a wireless connection to the DR-C125W at a time. If another user is using the scanner, an alert will appear asking them to disconnect so that the new user is able to connect. It is not possible to switch the connection mode between Access Point mode and Station mode in CaptureOnTouch Mobile. This has to be done in the ScannerWireless Connection Utility.With Station mode, the DR-C125W and PC/Tablet device need to be connected under the sameWi-Fi network.